Christmas is just around the corner, and you’ve just about completed your holiday shopping. You’ve got Christmas gifts for women, Christmas gifts for men, Christmas gifts for kids; but what about that special couple on your list? Of course, you could always run over to the local superstore and grab a generic gift box filled with a few pieces of not-so-fresh candy and a couple of coffee mugs, but where’s the fun in that? Besides, those types of gifts are so impersonal! That couple is obviously special to you, or else they wouldn’t be on your list of gift recipients. They are not just your everyday couple. They have made an impact in your life and they are very unique.They deserve unique Christmas gifts that let them know they mean the world to you this holiday season. Now before you go throwing on your snow boots and that bulky coat in order to suffer through yet another chaotic holiday shopping experience, there are some things you should likely know about shopping for unique Christmas gifts for couples. Grab a mug of cocoa and a few of your favorite Christmas cookies and I’ll fill you in. One common mistake well meaning shoppers make when it comes to buying unique Christmas gifts for couples, is that they tend to leave out the unique part. Search for gifts with meaning. Look for items you won’t find at every store in town. Your best bet? 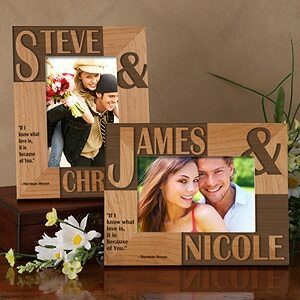 Purchase something personalized like this delightful Because of You Personalized Photo Frame, and give them something they can look at every day that reflects how special they are and how much they mean to you. This one of a kind frame is personalized with the first name of both individuals and your choice of a meaningful verse to create a customized gift that is certain to be treasured for years to come. Make it even more unique and personalize it with your own verse instead. It’s important to remember when you are shopping for a special couple that you are shopping for both individuals, not just one. An excellent idea is to offer them something that they can share and enjoy together. 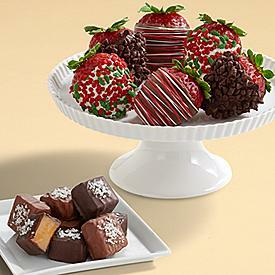 This Assortment of Sea Salted Caramels & Half Dozen Christmas Strawberries is a wonderful treat for that special couple to enjoy while they are cuddled up together in front of the fireplace this holiday season. This assortment contains a variety of chocolate dipped caramels and a half dozen juicy chocolate dipped strawberries that are sure to please even the most finicky o individuals, and there are just enough to share. 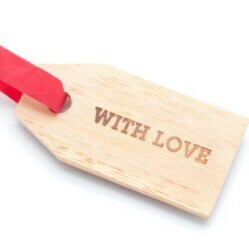 going to love keepsake items that reflect their love for one another. 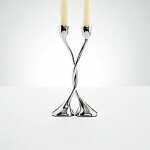 These unique Twist Candlesticks are all that and more! Created with a high quality nickel finish, these 10 inch intertwined candlesticks symbolize love, friendship and solidarity, and will make the perfect keepsake gift for that special couple on your holiday shopping list. 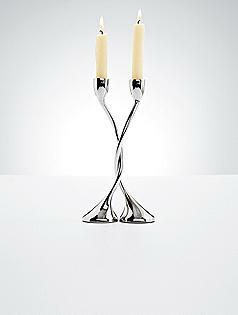 The set even includes two ivory tapers making them an instant addition to a romantic evening at home. What types of unique Christmas gifts do you plan to purchase for that special couple on your list this year?